Question: Where smoke detectors are installed in concealed locations more than ____ above the finished floor or in arrangements where the detector’s alarm or supervisory indicator is not visible to responding personnel, the detectors shall be provided with remote alarm or supervisory indication in a location acceptable to the authority having jurisdiction. Time is of the essence when trying to locate the answer to these types of questions. We can simply use the keyword: Smoke detectors when looking through the index to come across a number of sections. Browsing through each of the listed sections, we arrive at the answer of (c). Identification of which smoke duct detector has initiated an alarm condition is crucial because the fire causing the alarm may be located away from the actual duct smoke detector and it’s associated air handling unit. When a duct smoke detector (or any other smoke detector) is installed concealed (ex: above a dropped ceiling) a remote LED lamp must be provided for the device so that responding personnel can identify its location. 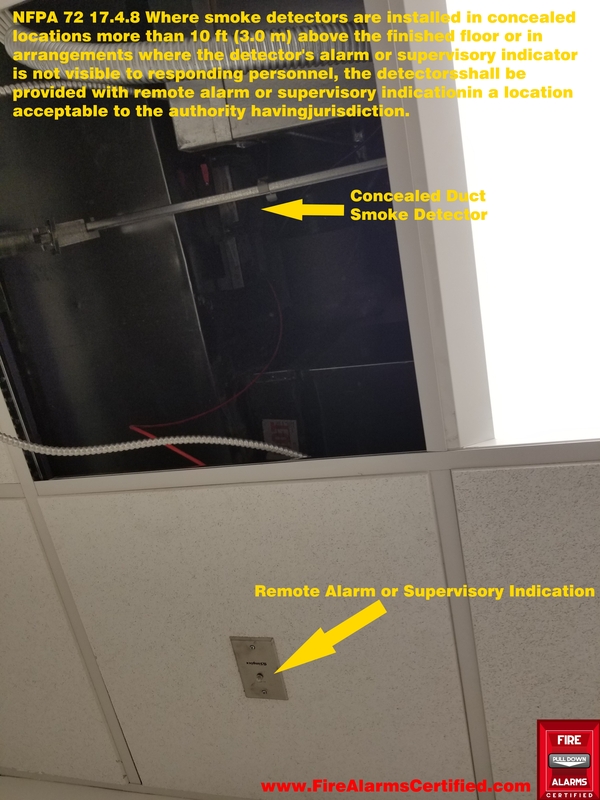 In the image below, we can see that the installer provided a remote indication lamp as per code; however, they failed to properly label the remove lamp indicating both their function and the air-handling unit(s) associated with each detector as per NFPA 72 17.4.9.